But since everyone is talking about video games in the Miiverse, you might accidentally read a spoiler. Good news: Spoilers can be hidden. 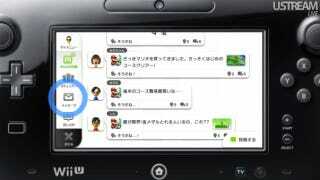 The MiiVerse is designed to quickly hide common spoilers through an automatic setting. You can have the option then to open the hidden spoiler comment. In some games, such as New Super Mario Bros. Wii U, it's even possible to leave comments in game. In Nintendo Land, for example, you can check out comments from others at each attraction. And since we are talking comments, here is the typing interface for the GamePad.